I bought 2 of these crossover tops and simply love them. I usually wear a medium, but followed the size chart and got them in small because I am smaller busted. The fit is perfect.Such a basic top. Can be worn out or tucked in. Love, love, love. I am trying to be open minded about designer clothing. 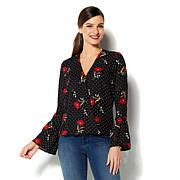 Iman has designed a beautiful blouse that can dress up anything it's paired with. I am not sure why it's not manufactured in US but it's her choice of locations. I hope piece will stand up to time. Love the fit of this top, well worth the money. 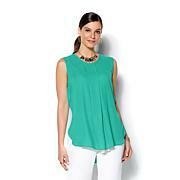 this is a flattering design, comfortable top and great buy! 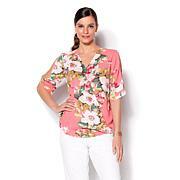 This blouse is made of great quality, fabric and shape, and fits as perfect as described. True to size. Well worth the money.